You can also follow @BW_React for live analysis. React Blog: Who’s Been Talking About Who This Election Cycle? This week the Brandwatch React team presented a collection of our US Election social data insights at Oxford University. The event focused on how the election has been going down on social media, and we decided to focus our presentation on the way candidates and voters have been interacting with each other online. 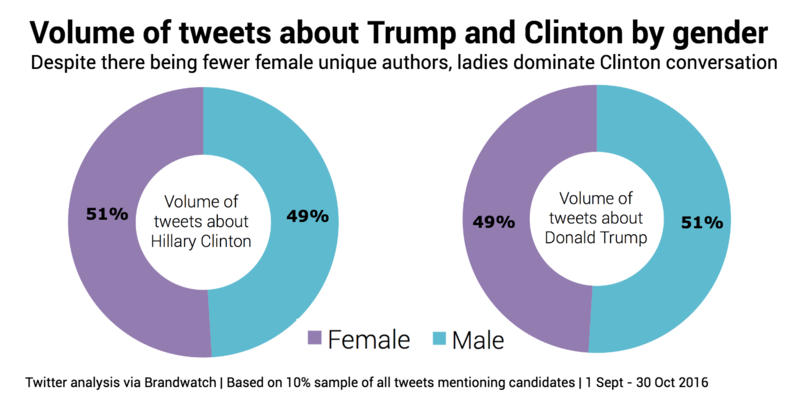 In general there are more male-categorized authors talking about the candidates, though females consistently out-tweet males during debates. 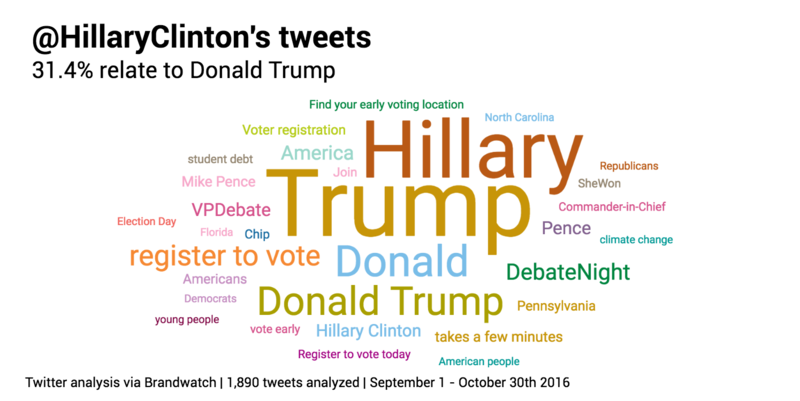 Hillary Clinton is tweeting about Donald Trump far more than he is tweeting about her. The most influential Republicans and most influential Democrats have a very different make-up when it comes to the number of organizational accounts and well-known/official figures in each list. When you’re considering the number of tweets directed at a candidate it’s interesting to look at both the volume of tweets overall and the number of unique authors posting them. 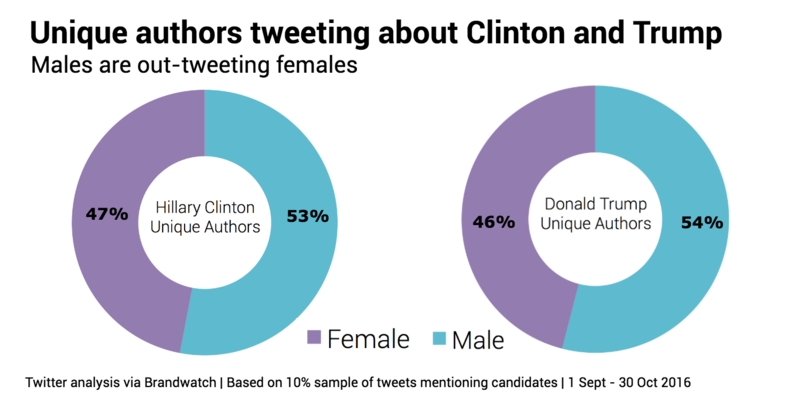 Taking a look at the gender breakdown of unique authors discussing Clinton and Trump on Twitter we find a similar ratio of male/female tweeters for both candidates, both with a slight skew towards male authors. (This is fairly consistent with our data on there being slightly more men on Twitter than women in the US). Things get a little more interesting when you compare this to the number of tweets directed at each candidate from men and women. 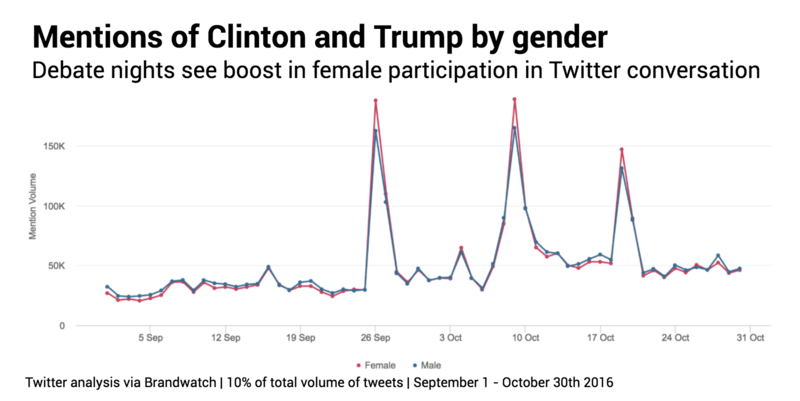 We found that women were tweeting at a higher rate per-person and produced a higher volume of tweets about Hillary Clinton than male-categorized authors. Another instance in which we saw a boost in female participation in the conversation is during the debates. This chart maps the volume of tweets by men and women between 1st September and 30th October. A chart looking at unique authors in the same period showed very similar spikes. While there could be a number of reasons for females out-tweeting males during the debates, a possible explanation is the prominence of Trump’s treatment of women in recent months. Clicking into the mentions of the second debate (the most tweeted about by women), “locker room”, “sexual assault” and “respect for women” were amongst the top phrases used by females. Looking at the way the candidates talk about each other and behave on Twitter reveals some interesting differences. Trump is a fairly sporadic tweeter with anything up to 267 tweets per day sent from his Twitter handles (in the period between September 1st and October 30th). Clinton’s record in this time frame is 95 in a single day. 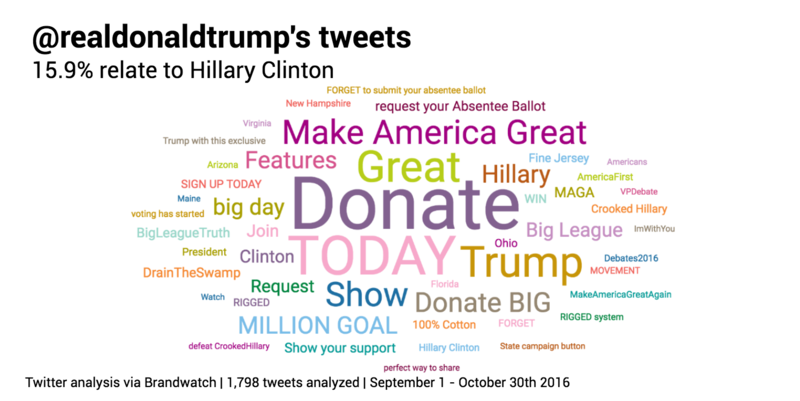 We found that within Trump’s tweets 15.9% were directed at Hillary Clinton. Meanwhile, within Clinton’s tweets 31.4% were directed at Trump. Within those mentions, Trump was more likely to @ mention Hillary Clinton with 47 @HillaryClinton mentions compared to her 19 @realdonaldtrump-s.
As more of the ways we see and do politics move online the more important it is to pay attention to the people making ripples in the conversation – the individual accounts that influence vast swathes of potential voters. 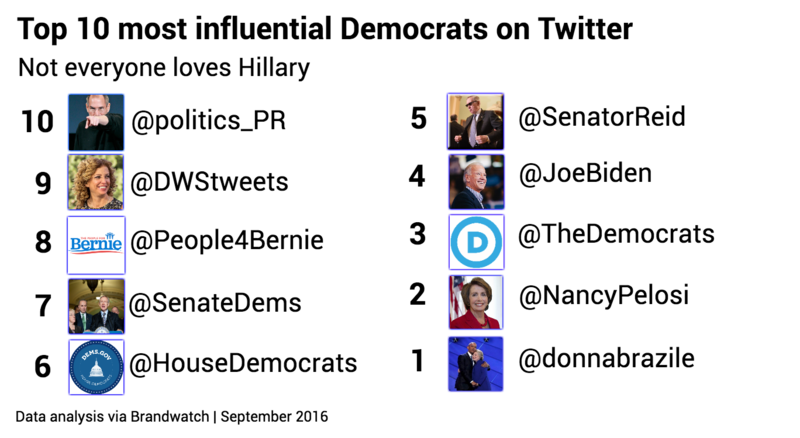 Earlier this year we used our tool Audiences to identify the most influential Republicans/Conservatives on Twitter as well as the most influential Democrats. Audiences can find accounts of interest by searching by bio or tweet content and then assigns individual accounts an influencer score based on criteria like their follower/following ratio, the amount of engagement the account generates and the influence of the other accounts they interact with. 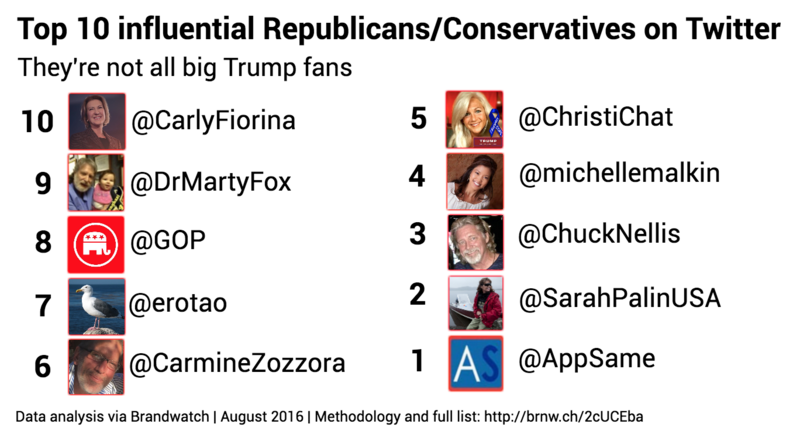 Here are the top ten most influential self-identified Democrats and Republicans/Conservatives on Twitter. We found that in general those appearing at the top of the Republican/Conservative list had a slightly higher influencer score compared to the Democrats. The Republican list also contained a lot more accounts belonging to “regular” people (as in, people who don’t necessarily have a large following outside of the internet) and fewer organizational accounts. The Republican list certainly lends some weight to the idea that Trump is running a grass-roots campaign that inspires regular people to make their voices heard, while the Democratic influencers are more likely to be well-known individuals that reinforce Clinton’s reputation as the “establishment” candidate. Subscribe to our Presidential Election Social Intelligence Bulletin for a monthly email focusing on the big topics around the campaign. Company number: 3898053 | VAT number: 754 7507 10 | © Brandwatch. All Rights Reserved.